As anti-worker lawmakers nationwide continue their assault on working families, Americans of all stripes have taken up the charge to defend the middle class from corporate-backed, Republican power grabs. But fighting for justice isn’t free, and our friends’ pockets are not as deep as those of the powerful interests seeking to erase our hard-won gains in the workplace and beyond. That’s why the IBEW International Executive Council recently passed a resolution to create a unity fund for local members fighting for the rights of working people in Wisconsin, Indiana, Ohio, Florida and beyond. The International Office has dedicated $100,000 to the fund. Locals in need of financial aid can apply for assistance through their district’s International Vice President. The people on the front lines need resources to tell the world the truth of what is going on and to keep the mobilization of members in high gear. 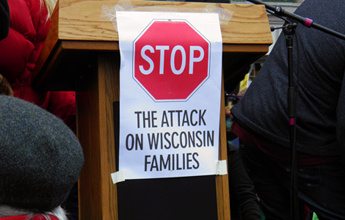 Even if the fight is not on your doorstep, the battles being waged by our locals and those of other unions in Wisconsin, Ohio, Indiana and elsewhere are your fight too. If ever there was a time to live by our core principle of solidarity, this is it. Photo used under a Creative Commons License from Flickr user paulbaker.